Contract Logix Premium Product Brochure. 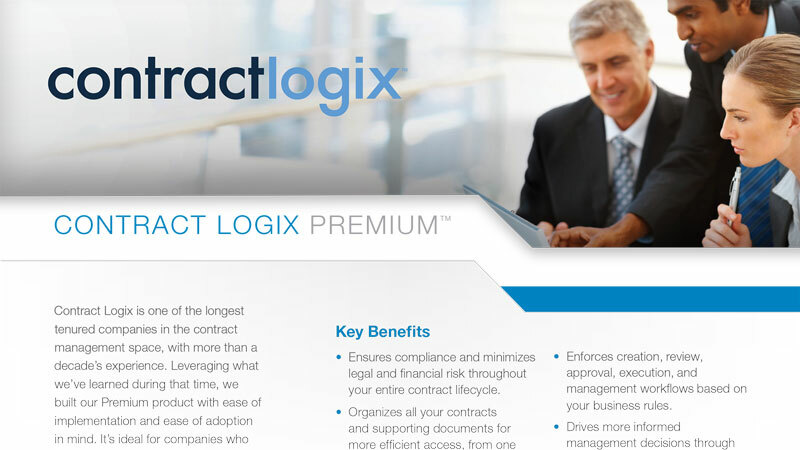 This 2-page brochure provides a brief overview on the Contract Logix Premium contract management software. It highlights the all the features and benefits included in our Express product (above), PLUS: contract creation using clause and template libraries, contract redlining and approvals, contract workflows, and contract requests and submissions. Safely and securely centralize all your contracts in one place. Never miss an important contract deadline — reduce your risk. Run reports, create dashboards, and search for vital information. Create contract documents using clause & template libraries of pre-approved language. Perform and track all your redlining and approvals during the negotiation process. Define your organizations contract workflows to add discipline to your processes. Enable those without full system acess, both inside outside your organization, to request or submit contracts. Need more CLM software resources? You’ll find them here!